How closely related are “buckle and pin” attachments for clothing items, rail attachments and magazine attachments for ranged weapons, ammunition within a magazine, “armor slots for armor plating,” and nested storage (particularly “certain storage for different item types”)? I have been making some assumptions and inferences that lead me to believe that these are all the same or very similar systems at work in different contexts, but I can’t really be sure that any of these isn’t an isolated system, (nor can my understanding easily be reconciled with that of someone who has made different assumptions and interpretations and come to a different conclusion,) without a clear definitive answer. What I can say for sure is that rail attachments don’t use nested storage at all, instead just acting as an attachment that occupies a hook and in turn provides a hook of a different rail system. A hook converter, of sorts. 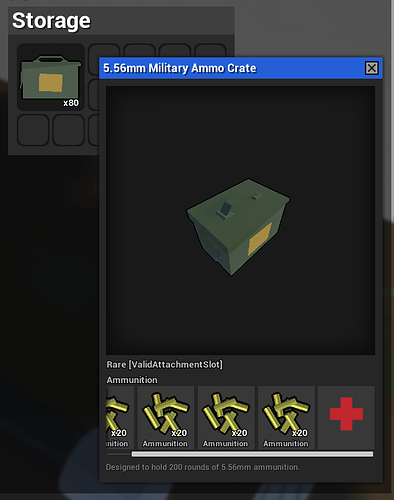 I wouldn’t be surprised if plate carriers or magazines utilized nested storage though. 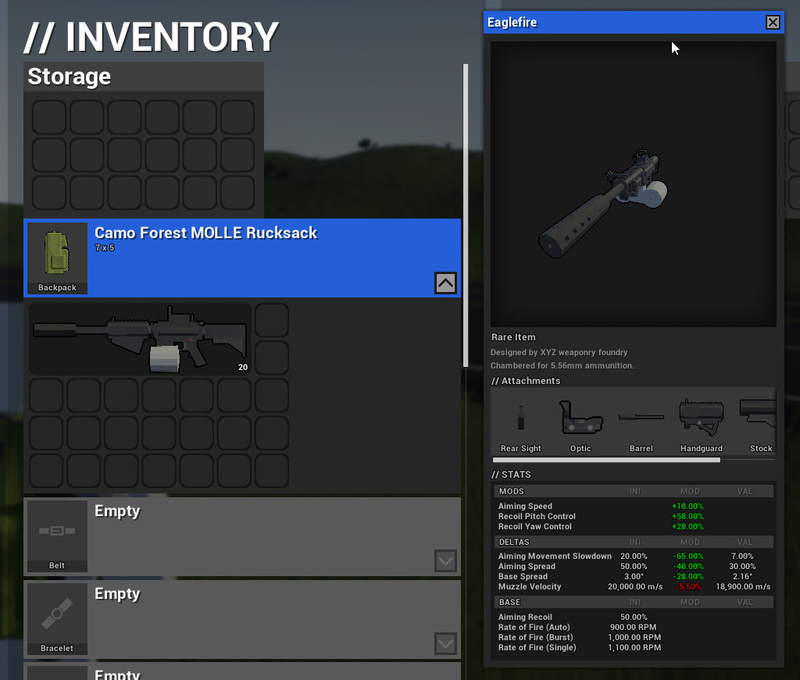 What if you make it so, that when you right click on the inventory object, there is an option to see hook and attachment points to add objects? A preview pane already exists for items in the inventory. You can directly, for example, manage attachments and components of a gun through this screen, or view nested storage within an ammunition crate. What about vests and backpacks, could you add attachments for those?